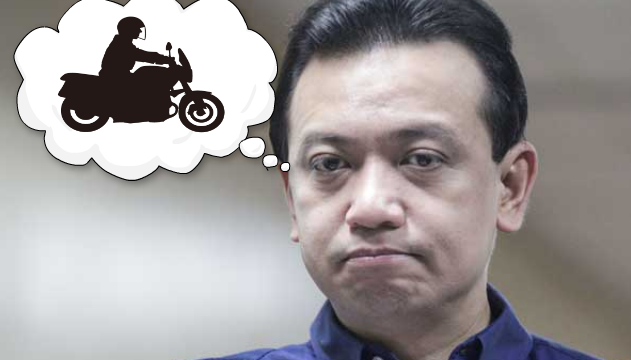 Sen. Antonio Trillanes IV has decided to no longer push through with his plan to leave the Senate building — where he has been holed up since last week after President Rodrigo Duterte "nullified" his amnesty — after motorcycle-riding men tried tailing his car. 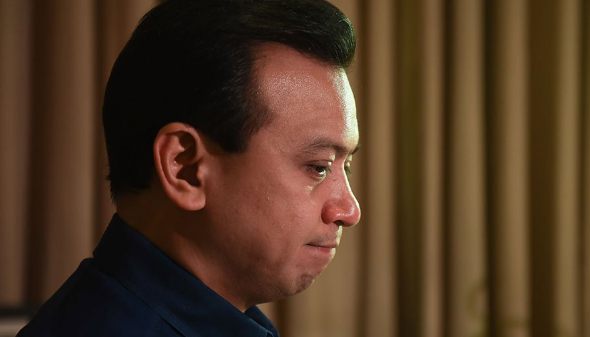 At a press conference outside his office, Trillanes said he would not go home yet after learning that men aboard motorcycles followed his vehicle as it went out of the Senate building for two consecutive days. "Last night and kanina nung lumabas ang aking sasakyan para may kunin at magpa-gas ay sinundan ng naka-motor na tao," the senator told reporters. He said they could not yet tell if the unidentified men were members of the military or police since they were in plain clothes. Trillanes said they were able to take a picture of the men. He further said that the number of police personnel outside the Senate premises increased after he announced his intention to go home earlier in the day.“Nagkaroon ng augmentation ang PNP personnel outside at ang intensyon daw paglabas ko they will stop me from going back in. And a few hours ago eh talagang winarninangan na kami, ako ng AFP arresting units na talagang huhulihin ako paglabas,” he said. “With that ang decision is again to remain in the Senate for as long as walang categorical statement ang AFP na hindi nila ako aarestuhin by virtue of proclamation at any court martial charge at na-validate namin sa ground na ang kanilang order ay hindi na ako arestuhin, it’s prudent to stay here,” he added. He said his arrest, if ever, will affect the petition they filed before the Supreme Court and Makati regional trial court. “I was advised by my lawyers kasi daw it will affect our petition kasi ang kinukwestyon namin ay issuance of warrant. If I will be arrested it will be moot and academic, ang kukuwestyunin mo na ‘yung illegal arrest,” he said. The senator, also at a press conference, had earlier said he would attempt to "quietly" leave the Senate building within the day. "Susubukan ko mamayang lumabas. We will do it quietly para we'll see," Trillanes told reporters.